How to Relieve the Pain Caused by Corneal Abrasion? 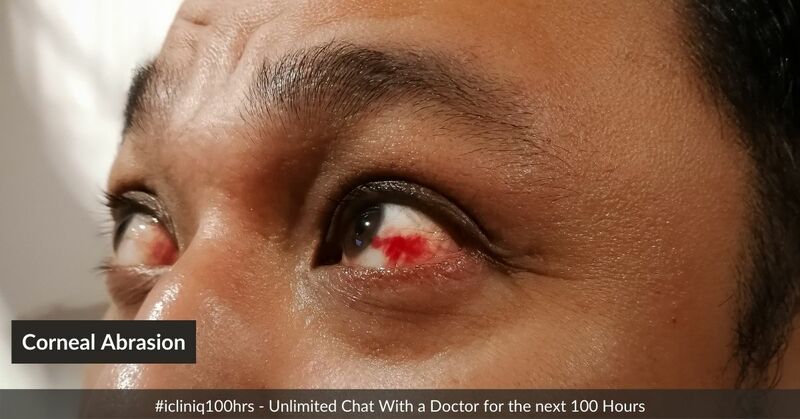 iCliniq › Ask a doctor online › Health Articles › Grittiness In Eyes › How to Relieve the Pain Caused by Corneal Abrasion? • What Are the Precautionary Measures? • How to Treat Pain Due to Corneal Scratching? • How to Confirm Diagnosis? • What Are the Complications After Abrasion? Scratched cornea of the human eye is also known as corneal abrasion. Cornea is a colored protective layer over iris and the pupil. Corneal layer is important for vision, filtration of harmful rays such as intense ultraviolet rays and protection. Corneal injury means injury of epithelial surface of eye (most superficial layer). Abrasion is limited to top most five layers of the cornea. Any dust or sand particles trapped inside the eyelid lead to scratching of cornea. Scratching of cornea leads to pain, heaviness and discomfort. Eye scratching is ranging from small to large abrasion. Causes for Scratching of Cornea? Hurting the eye with fingernail is the most common cause. Trauma due to external force from plants, leaves, branches, piece of paper or cardboard, make up brush or any other objects. Blowing of the foreign particles such as fumes of deodorant, perfume, dirt particles, sand, hot cigarette ash, etc. These particle which are caught into eyelids lead to scratching of cornea. Accidental exposure of eyes to any harmful chemicals leads to burning injury and abrasion. House cleaning agents such as acids, phenyls, bleach and toilet cleaners are the common ones. Plaster dust is a strong alkaline material which leads to scratching. If a person rubs his eyes intensively. If person is wearing old or cracked or expired contact lenses, improper fitting and poor hygiene of contact lenses also cause this injury. Bacterial infection of the eye (secondary traumatic iritis). During surgery, if cornea becomes dried out, it causes corneal abrasion. Sometimes scratching is due to very intense bright light such as welding without eye protection. Sometimes injury occurs due to reflected sunlight from snow. Exposure of intense ultraviolet rays may lead to scratching. Wind blow also causes injury. One should keep blinking many times. One should avoid rubbing of the eyes and immediately wash the eyes with clean water or sterile solution. If any thing is trapped inside the eyelid, do not try to remove it. Retinal doctor should remove this. Precautions should be taken during washing the eyes because several times washing may further disrupt corneal epithelial surface. It may increases the scratching. Symptoms are present from few minutes to several days. Presence of gritting sensation in the eye, or having foreign body sensation inside eye. Eye pain appears on any extraocular (eye muscles) movement such as opening and closing of eyes. Presence of inflammatory signs such as redness and swelling. Frequent tearing from the eyes for a prolonged period of time. Eye becomes very sensitive to light. Abnormalities are present with vision, such as vision becoming blurred. Patient feels uncomfortable while driving, working, reading, and sleeping. One should wear sun glasses because glare of sun may lead to pain in the injured eye. Slit lamp examination and fluorescein instillation is useful to confirm the exact diagnosis. Ocular CT scan and MRI are also useful for large erosions. Corneal ulcer is a one of the complications. Bacterial culture is necessary before instillation of antibiotics. How to Treat Pain Due to Corneal Scratching? Purpose for treatment is to reduce pain and complications. Healing takes time. Sometimes healing takes more time and also requires extensive treatment. Can vestibular problems and C5-C6 bulge cause headaches? I inhaled enamel paint residual fumes. How will the health be affected? What is the reason for continuous eye allergy and irritation? Treatment is initiated with removal of contact lenses. Washing of the eyes should be done with cold water for 15 to 20 minutes. If any foreign particles are trapped into eyelids, it will be removed immediately with the help of cotton wool. Sometimes doctor has to use fine needle to remove or lift particles from the eyes. That time local anesthetics are used to ease the pain. Doctor can easily remove this because eye surface is surprisingly very hard. Minor injury takes only 24 to 48 hours for healing. Deeper tissue scratching causes scarring of cornea and it is treated by corneal transplant. It is used for analgesic effects. Anesthetic drugs are Tetracaine and Proparacaine. Tetracaine - it is used in the form of solution or ointment. It works by blocking of impulses to transmit through restriction of sodium permeability into neuronal membrane. Sodium is an essential part for depolarization (activation of cell). Its effect remains upto 30 minutes. And its effect starts within 1 to 2 minutes. Dose - instill 2 drops in both eyes every 4 hours as required for pain relief. Proparacaine - it has less irritating property. It works by providing stability to nerve cell through inhibition of initiation and transmission of impulses into cells due to impermeability of essential ions. Its effects start within 20 to 30 seconds after application and remains for a maximum of 20 minutes. Dosage is same as above. Antibiotic ointments are very useful and first line of treatment in this case. Its usage is different in contact lenses user and non contact lenses users. Erythromycin ophthalmic ointments are used for three to five days. Dosage - four times in a day in the affected eye. Sulfacetamide ophthalmic. Dosage - four time application for three to six days. Polymyxin trimethoprim ophthalmic. Dosage - four times in a day for 5 days. It is also available in solution form. One to two drops are instilled in the affected eye. Ciprofloxacin (0.3%) is instilled in the affected eye. One to two drops four times in a day for 5 days. During treatment, use of contact lens must be avoided strongly. Levofloxacin (0.5%) ophthalmic solution, Moxifloxacin (0.5%) and Ofloxacin (0.3%). Dosage is one to three drops are instilled into affected eyes followed by instillation of eye drops every two hours for two days, followed by instillation of drops every four to eight hours for five days. Eye patch - Non-infected corneal abrasion is treated by topical antibiotics. Relief from pain due to abrasion is achieved by patches also. But use of patches has become limited nowadays because during removal of the patch from the eye surface, it strips out the healing tissue and abrasion aggravates. Some times patient find loss of binocular vision with use of patch. Binocular vision means vision from both eyes. High chances of complications reduce the use of patches. Pain killer eye drops - Diclofenac or Ketorolac eye drops are used to treat pain due to scratching. These drops come with antibiotic drops and disposable contact lenses also. These drugs maintain proper vision and help to decrease inflammation. Drops should be instilled in the affected eye. Dose - one to two drops four times a day for less than two weeks. Oral pain killers - Paracetamol or Ibuprofen 250 mg twice a day for a week is prescribed for pain relief in eye. These drugs may reduce pain up to 90%. Diclofenac or Aceclofenac - these are nonsteroidal anti-inflammatory drugs and best option in place of patch. It is available in drops with disposable contact lens. Diclofenac is used as Diclofenac potassium or Diclofenac sodium for pain relief. It decreases the prostaglandin activity through reduction of cycloplasm activity. Prostaglandins are an essential part of initiating pain. Dose - 50 mg every 8 or 12 hours. Oxycodone or Acetaminophen - it is a type of opioid agonist. It gives relief from moderate to severe pain. Dose - 2.5 mg/325 mg: 1-2 tablets every 6 hours depending upon requirement. It works by blocking the ascending pathway of pain. It causes respiratory depression, analgesia and sedation. Cold compresses should be used to get relief from edema and intense pain. Warm compresses are used after two days of injury. Artificial tears or lubricants are used to relieve pain, swelling and irritation. What Are the Complications After Abrasion? There are many complications due to eye abrasion such as scarring, fungal ulcers, amoebic keratitis (corneal infection by amoeba), pseudomonas (one type of bacteria) infection, corneal infiltrates or ulcers (local or diffused grayish area with inflammation and edema around cornea). Do you have a question on Grittiness In Eyes or Burning Sensation In Eyes? What happens to the dust that enters the eye? Will it affect the eyesight in the future?